Frontispiece designed by Thomas Buford Meteyard for Songs from Vagabondia by Bliss Carman and Richard Hovey, published by Copeland and Day. F. Holland Day: Menelek, 1897. Platinum print at The Met. Copeland and Day printed a limited edition pamphlet of Carman’s poem “St. Kavin” that was distributed only to Visionist members. A hand-written note on one member’s copy calls Carman “the prince of Visionists”. Above: Portrait of Bliss Carman by Pirie MacDonald. A print at the Library of Congress. 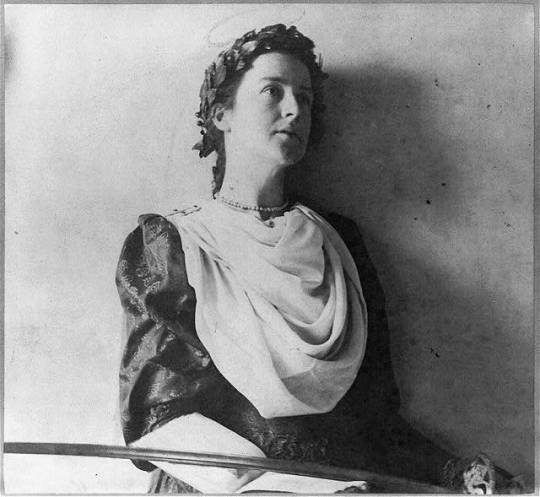 Louise Imogen Guiney (1861-1920) was a poet and writer from Boston. Her work included sonnets and other formal poetry, as well as essays and biographies. Guiney came from an Irish American Catholic family and her father was a well-know Union officer in the Civil War. In the 1890s she was part of several literary societies, allowing her to interact with established as well as up-and-coming writers, and introduced several of the friends who would form the Visionists. 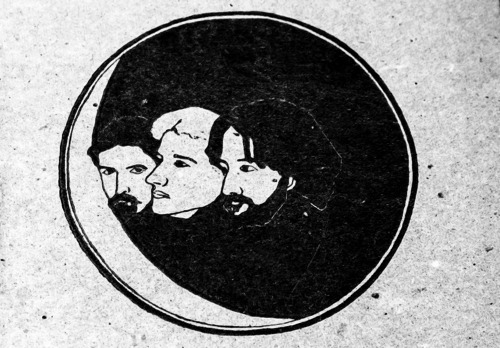 At a time when most clubs and societies were single-gender, the Visionists were an exception– Guiney took part in their mostly-male gatherings as did fellow writer Alice Brown. The journal The Knight Errant took it’s name from one of Guiney’s poems, included in the first issue. Unlike her close friend F. Holland Day, who came from a wealthy family, Guiney had to find time for writing while working day jobs. 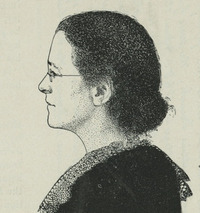 She ran the Auburndale post office in Newton, Massachusetts, and later became a cataloguer at the Boston Public Library. In 1901 she moved to England, where she felt she could better focus on writing. Guiney’s Catholic identity was very important to her at a time when discrimination against Irish Catholics was common in New England. In his autobiography Ralph Adams Cram recalls that many residents of Newton refused to use the Auburndale post office after learning it was run by a “Papist”. Her bohemian Boston friends flocked to Auburndale to buy stamps and insure she met her quota. Guiney and her mother owned a beach house in Maine, nicknamed “Castle Guiney”. Day bought the house from them as a way of helping Louise financially, and renovated it to the “Little Good Harbor” estate where he did much of his later work and hosted fellow photographers. Above: Portrait by F. Holland Day, 1893, of Louise Imogen Guiney, dressed as St. Barbara (with halo added in pencil!) St. Barbara is associated with soldiers and this persona may have been inspired by Guiney’s war hero father. Print in the Library of Congress. Above: Drawing of Louise Imogen Guiney by Thomas Meteyard, her author picture for a book published by Copeland and Day. 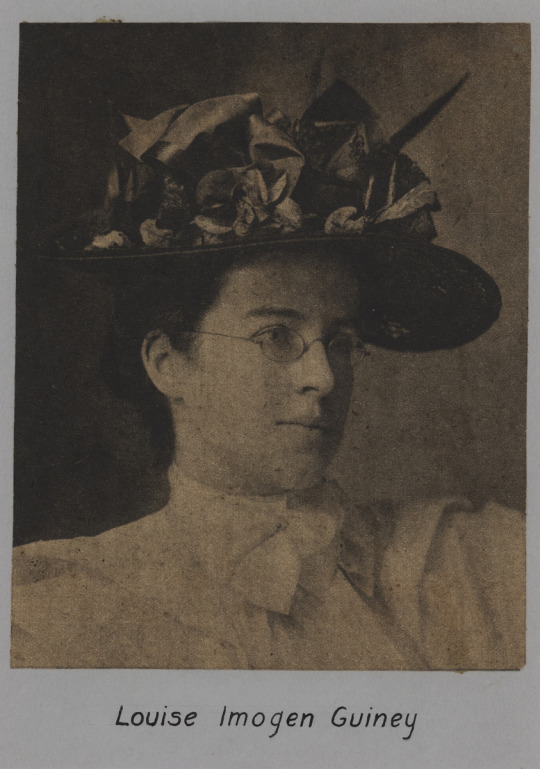 Above: Portrait of Louise Imogen Guiney from Loyola University Special Collections. 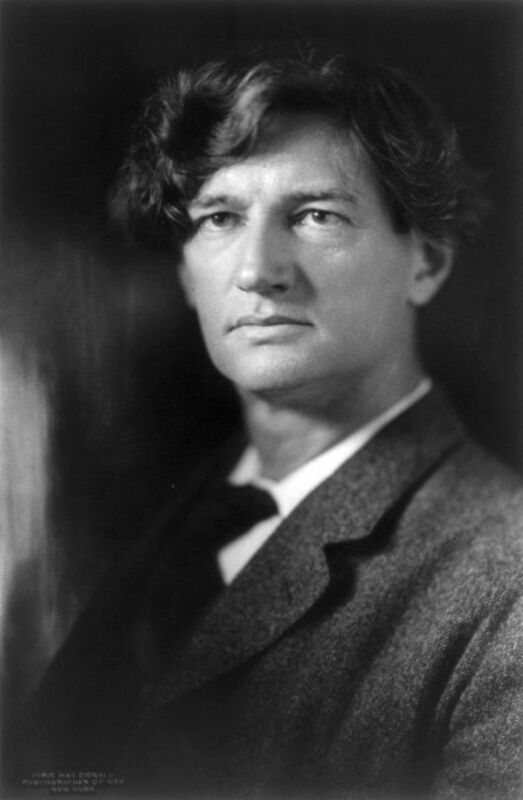 Ralph Adams Cram (1863-1942) was an architect and writer based in Boston. He is best known for his churches and public buildings, which include the Cathedral of St. John the Divine in New York and key buildings on the campuses of West Point, Princeton U., Rice U., U. of Southern California, and others, and both bridges between Plymouth, MA and Cape Cod. The Berkeley Building (aka The Old John Hancock) in Boston’s Back Bay was designed by his firm shortly after his death and pays tribute to the style he established. He also served as Head of the Architecture Department at MIT. Cram grew up in New Hampshire and moved to Boston to pursue architecture, landing a job at a firm with the help of family friends. He also worked briefly as an art critic for a local newspaper. After winning a small amount of money in an architecture contest, he traveled to Europe with a close friend. This trip had a major impact on him– it inspired his lifelong interest in pre-Renaissance art and architecture, and during his visit to Rome he was inspired to convert to Anglo-Catholicism (ie the Church of England, now better know in the US as Episcopalianism). One of Cram’s heroes was pre-Raphaelite art critic John Ruskin, who advocated a neo-Gothic approach to architecture, applying medieval principles to modern applications. Cram championed this style in the US, a reaction to the neo-Classical styles he felt had been overused and cheapened here. In the 1890s Cram was a key figure in Boston’s bohemian scene and a member of the Visionists. 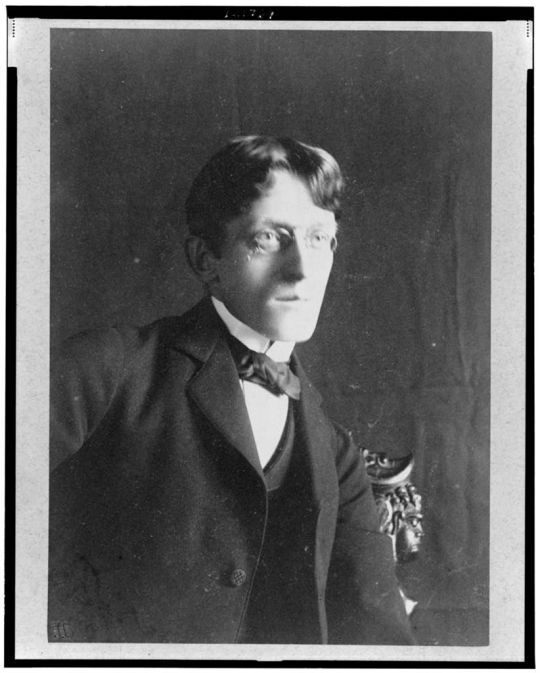 During this time he wrote two books he later described as “indiscretions,” both published by fellow Visionists Copeland and Day. Black Spirits and White is a book of ghost stories inspired by his travels in Europe. The Decadent is a dialogue between two Visionist-like characters, one who advocates Christian Socialism and another who argues that Western civilization is in a period of decline (”decadence”) and advocates inaction. Cram founded an architecture firm in 1889 with partner Charles Francis Wentworth. Visual artist and architect Bertram Goodhue moved to Boston to work for the firm as a draftsman and later became a partner. He also became a member of the Visionists. Both Cram and Goodhue had strong visions of their own, and Goodhue eventually moved on. In 1913 the firm changed its name to Cram and Ferguson. In 1916, Cram masterminded an elaborate pageant titled “The Masque of Power” to celebrate MIT’s move from Boston’s Back Back to its current home in Cambridge. He recruited about 1700 participants in costume and a professional choreographer, and cast himself as Merlin. Above: Portrait of Ralph Adams Cram by F. Holland Day about 1890. Print in the Library of Congress. 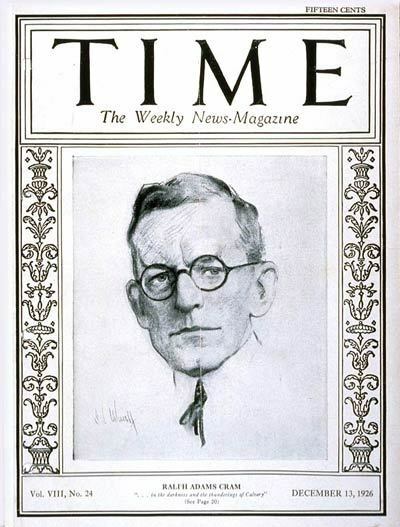 Above: Ralph Adams Cram on the cover of Time magazine, 1926. 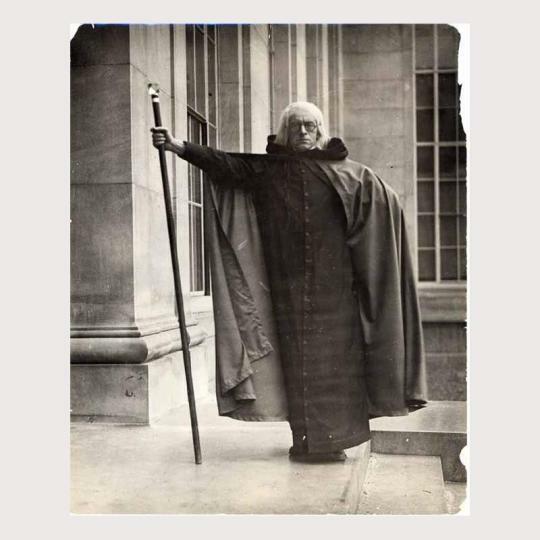 Above: Ralph Adams Cram dressed as Merlin for “The Masque of Power” pageant celebrating MIT’s move to Cambridge, 1916. From the MIT Museum. If you are familiar with MIT you may be familiar with this image which hangs in the “Infinite Corridor” as part of a display commemorating the move.